I always dreamed of having twins because the thought of it thrilled me. Although twins doesn't run in our blood. Life will be twice as much fun and twice as much exciting and challenging in raising them. Also, I'll get to buy matching outfits and dress them up to look alike. Whether they are fraternal or identical twins I'll go for it. I love kids and I love being around them. Their innocent smiles brightens my day. I love to pamper them with lots of TLC(tender loving care). I actually have three children of my own, all boys ages 11, 5 and a 5 month old baby. Today, I had the opportunity to be a nanny of my friend's baby girl. My baby and her baby were born 11 days apart. I had a great time because the babies made my job easy. They were just having fun playing with their toys. They also watched my son's favorite show, it's Yo Gabba Gabba. Feeding them was a bit challenging especially when both of them wanted their milk. My baby is breastfed while my friend's baby drink milk from the bottle. Can you imagine my dilemma? Somehow, I managed to feed them both and put them to sleep. Thankfully, my 11 yr old son had a half day of school. He helped me around the house and with the babies. Overall, it was a nice day and now I know how it felt like having twins. And still, I am not going to stop dreaming about it. Too cute! 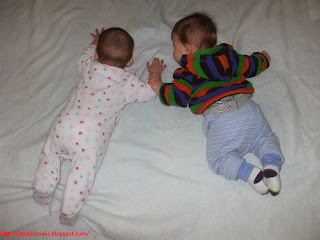 I couldn't imagine twins lol :) it was fun for a while to have two little ones near the same age to see how it could be. I have only son he's 10. Ohh look how happy they are now that the tummies are full! It must be fun playing with the two babies. I am not sure if I will be able to take care of twins lol. You are awesome sis. they look twins, it's truly fun to be able to have kids on the same age. I always wanted twins but I guess, God gave me just one to cherish and love. It's nice that you've gotten that chance to take care of babies almost the same age.